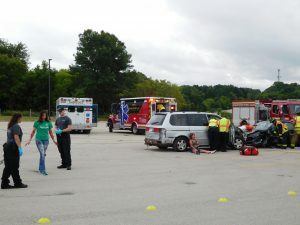 The Friday morning “announcement” at WPA was a staged car crash. They brought in a friggin’ helicopter! 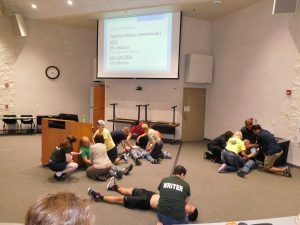 For the Saturday morning “announcement,” we had an knife attack in the lecture hall. A person will bleed out in three to five minutes. If you’re bleeding out, I can improvise a tourniquet with a two-inch wide band of material and something to twist it up good. In hand-to-hand combat, the rule is “flesh to bone and bone to flesh.” In other words, palm jab your opponent’s chin, but use a fist in the gut. 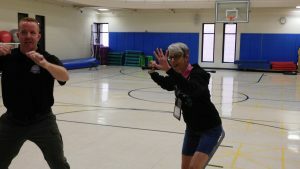 After whipping out a baton, I assume the position taught in DAAT, Defense and Arrest Tactics. An SWAT officer’s vest weighs 25 pounds, but better to sweat than bleed. CORRECTION: I originally posted this as just an “officer’s vest.” A regular police vest is closer to 6 pounds. However, one officer, in responding, mentioned that he once weighed himself in gym shorts before suiting up at 165. After donning his uniform, vest, belt, and tools, he weighed 200 pounds! The bottom line is that along with the weight of the world, they carry a lot of physical weight, and lower back problems are common among police officers. 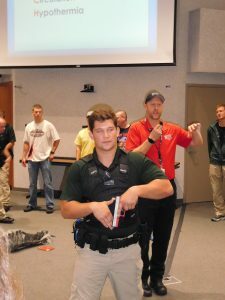 Officers wear tee-shirts to prevent chafing from the vest. The police do NOT tell people to stay in town. That could constitute arrest. Miranda Rights are given only in cases of a custodial interrogation. Officers are twice as likely to kill themselves as kill another. What is an officer’s most important tool? Answer: His discretion. An officer shows us the SUL (Portuguese for south) method of holding a firearm. 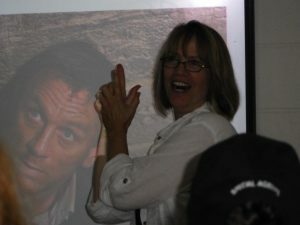 Robin Burcell hams it up with the silly Hollywood version of an officer holding her weapon. This conference was so awesome! And here I thought I didn’t have the comments enabled for this post. 🙂 Yes, excellent conference. I could easily do 10 more nuggets. Cool stuff, Vinnie! Sounds like a wonderful conference. Perhaps one day I’ll get there. Glad it was fun and educational! Thanks for dropping by, Kathy. The conference was such a sensory overload that I’m still recouping.